The “M” in S.T.E.A.M. stands for Mathematics! Concrete experiences with math concepts and interactions with teachers have a direct impact on your children’s acquisition of mathematical skills. 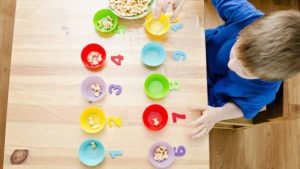 When children manipulate materials in their classrooms and learning centers, they practice math skills. 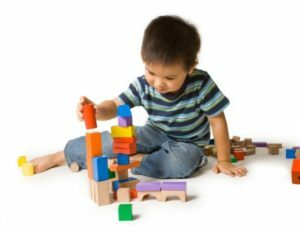 For example, in block centers, children explore the differences in sizes and shapes of blocks, count the blocks in a tower and experience cause and effect when the tower tumbles down. In the library center, they find books that promote shape recognition and sequencing knowledge, and teachers may read stories that focus on problem solving or time concepts. 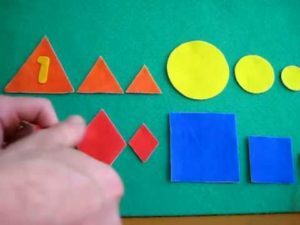 Infants: playing with shape toys or different sizes of rings, singing counting songs, looking at pictures of matching items, choosing between two sizes of blocks presented by teacher. 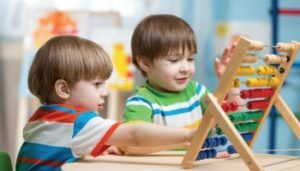 Toddlers: using shape-sorting toys, stacking blocks, lining cars up by size or color, counting balls, gluing different sizes and shapes of materials. Preschool: doing pattern-block activities, charting and graphing of siblings or pets, measuring ingredients for playdoh, counting and distributing plates for lunch, matching games with numbers and amounts. School Age: creating calendars for monthly activities, playing games, developing class charts, conducting science experiments, and playing math mind twisters. The Learning Purpose Notations for every activity are marked on the weekly lesson plan in your child’s classroom. Our teachers describe the Cognitive & Math, Language & Literacy, Social & Emotional and Physical Development developmental objectives to help illustrate the learning opportunities your children experience throughout the day. Engaging activities and routines build these important math skills in “every room, every day” at Stepping Stone School!